First a giant airplane loaded with people and fuel simply vanishes over the ocean. Then a wall of mud a mile wide slides down a mountainside and buries a small community of houses and people. What’s next? 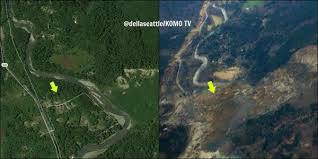 It disturbs me that so far I’ve heard not a whisper of the question of whether this week’s Washington state mud slide was caused by logging and/or development. Was there clear-cutting going on in the ridge above the little town that got buried? Was the town itself part of the problem, the clearing for houses taking away the trees that had been doing the good work of holding the landscape in place? The obvious culprit being blamed is simply too much rain, yet another example of our climate going haywire in response to the destabilization of too many humans burning too much fossil fuel. I’m glad to see glimmerings of recognition inside the insular Washington DC Beltway that the effects of climate change are here and are only going to increase in the coming years. Earlier this month a group of Democratic Senators staged an all-night climate change rally, Senate-style—meaning, they talked about climate change all night long to raise awareness and bring attention to the urgency of the issue. Talk is cheap; action is what counts. So far we have not seen nearly enough action aimed at shifting our economy towards renewable energy and “sustainable growth”—scare quotes because “sustainable growth” may, in fact, mean “limited growth,” anathema in American political/economic circles. We know now that if human population and resource consumption continue to rise at current rates, we will simply decimate our planet, like the locusts we are coming to resemble. That way lies death, terror and madness. We have already altered the climate enough to keep the disasters rolling in—floods and droughts, wildfires and hurricanes, spring blizzards and summer heat waves…we’ve seen it all and this is the new normal for the rest of our lifetimes. We need to acknowledge that building resiliency is of paramount importance in these critical years while there is still enough political and social stability to make the adaptive changes that are needed. Building resiliency means shifting to renewable energy—solar, wind, tidal, geothermal—that is locally based all over the planet. Forget about pipelines and oil tankers. 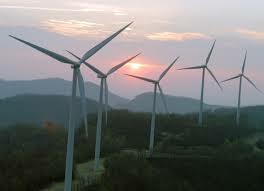 Forget about huge power lines criss-crossing the countryside. We need to move towards a distributed energy model where each town and county becomes responsible for its own energy needs, and has back-up plans in place for the times when those floods and storms hit. The same thing goes for food production. Forget about shipping tropical fruits north to please the fancy of the WholeFoods crowd. Forget about ripping up African rainforests to create palm oil plantations. We need locally based agricultural production that can sustain populations where they are. We need to return to the resiliency of pre-20th century human populations, but now connected as never before by our awareness of the role we can play, for good or for ill, in the global biosphere. We also need, unpopular as it may be, to curb human population growth. Sharply. Now. Those who live to tell the tale of the 21st century will look back on the 20th century as the unfolding of the greatest nightmares the human species has ever faced. In the 21st century, all those disastrous chickens hatched by the petro/agri/chemical industries of globalized capital are coming home to roost, and none of us will be able to build a wall high enough to keep them at bay. If we want to survive—if we want to bequeath a livable planet to our descendants– we need radical new thinking, backed by urgent and committed action. Now, before the next mudslide, the next flood, the next wildfire sweeps more of us away. Last night I watched an interview with a geologist from U. of Washington. He said that mountain is prone to mudslides and each time one occurs the land becomes more unstable. He said engineers had made several attempts to shore up the banks of the mountain. He also noted that logging in the area had occurred in the years in between mudslides. Interesting. The engineers made attempts “to shore it up”, but no attempts to stop the logging? Way to go, ey? That’s how our civ works. Like in cancer. All the medical technology to the rescue, but nothing for prevention. Thanks for raising awareness of this disaster. If people want to help the survivors and community, I’ve posted some links at http://wildninjablog.com/2014/03/25/oso-aid/. Thank you! Amen to this piece, Jennifer! Resilience is definitely where it’s at. And it’s going to have to be people’s resilience, because all the big boys do is talk. And they avoid even talking about what’s important, so as not to anger their supporters, the states and corporations that are making trillions with their “profit now, don’t worry about later” attitudes. By the time the effects materialize, the causes are safely tucked away: the US demand for drugs murdering hundreds of thousands around the world and destroying states while at it, the debacles in Iraq and Afghanistan and elsewhere traceable to US intervention, pollution now judged the foremost cause of environmental death worldwide due to no one getting really serious about climate change largely caused by green house gas production . . . and on and on. Where people are taking these problems into their own hands, we begin to see progress.